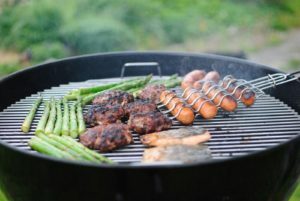 If you have a gas grill, make sure the connections from the propane tank to the grill are tight. Use porcelain rocks instead of lava rocks. Lava rocks are porous and can hold grease, which can catch fire and make for an uneven heating surface. When you turn off a gas grill, remember to turn off the propane tank too.